This is a piston design bypass valve that is a direct replacement for the original fitment. 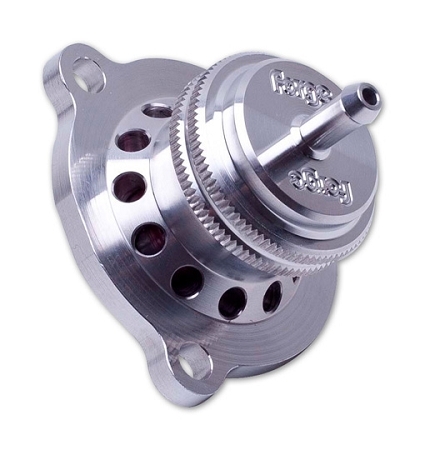 This valve gives greater longevity than the diaphragm (OEM) valves but also benefits from its ability to be fitted with different springs when the boost pressure has been increased or the engine has been modified. To ease installation the top or vacuum connection is angled. Have no problems with mine, good fitment, louder "WOOSH" then factory. Not as loud inside the car with windows up though, as this is an Atmospheric. I am tuned and have Injen CAI on an Eco. Not as loud as just with short ram intake, but a much crisper and noticeable noise. Pre-installed spring (green) works perfectly and a 2nd spring (yellow) comes with it for higher boost applications. Defeats compressor surge at high RPMs/high boost. Get this or the Forge BPV, it's a must have over the factory piece. BNR is awesome with extremely quick shipping and great customer service. The quality of this blow off valve is outstanding! It looks and functions great and when you remove the factory BPV you appreciate it even more, all billet aluminum vs plastic and rubber. Install is a little tight but all it takes is patience and the removal of three T30 bolts, a vacuum line and then reverse to get the Forge back in. The sound is great as well, it gives you a quick burst of air when you let off of the throttle. BNR that's for the great customer service and parts! Love the quality over stock. The sound of this bov puts a smile on my face every time I drive my car. Not the best, but a bolt on. Mine leaked badly, I spot faced the lower piston side and that worked for a short time. I ordered another and am hoping the first was a fluke. The factory one surges the turbo with a tune, so this is a must have upgrade. I prefer diaphram types, so I am biased. 158 points will be rewarded to you when you buy this item.